Try to say these ten times fast: HD-CCTV, HD-SDI, HD-CVI, HD-TVI, HD-AHD! HD-CCTV (High Definition-Closed Circuit Television) is CCTV’s answer to the IP camera’s high definition image quality. This technology can transmit uncompressed high-definition video over point-to-point coaxial cables. The biggest benefit we saw at the advent of HD-CCTV was the fact that newer HD-CCTV cameras did not need cabling upgrades. The original coaxial cables from the CCTV era had enough unused data spectrums that they could be used for the new HD-CCTV cameras. This made it easy to install brand new cameras while not needing to overhaul your entire cabling system. When you consider how much time and money some have invested into their CCTV systems, this was a huge deal! The race to produce HD-CCTV standards first gave us HD-SDI. It is an important development, but we are going to focus on HD-CVI, HD-TVI, and HD-AHD as these are the strongest technologies currently and going into the future. HD-CVI (Composite Video Interface) was developed by Dahua in 2012 and began to saw wide-release in 2014. This technology was a breakthrough for CCTV cameras as it brought HD images and allowed for high-definition analog images to travel well over four hundred and even five hundred meters of cable. 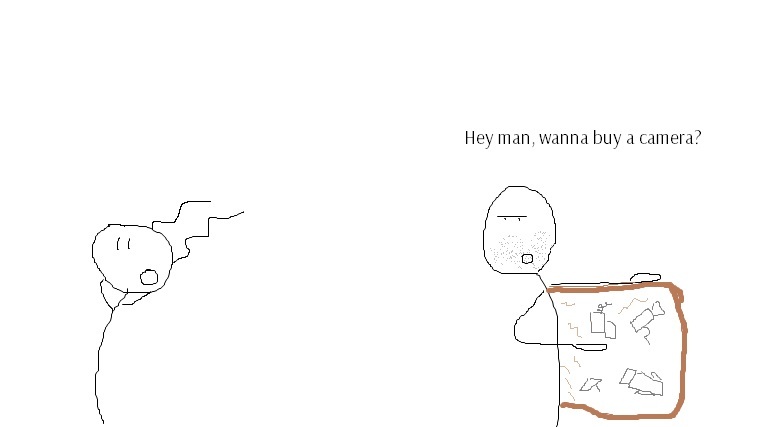 (Once an image is traveling far enough, it begins to need boosts to help it get through.) HD-SDI, a digital technology that got its first footing in the late 80s, could only send these same images up to 100m. With composite video transmission technology, all information including video, audio, and serial data could be sent down just one line of cable. It wasn’t long for other forms of HD-CCTV to begin popping up on the market. HD-TVI (Transport Video Interface) was developed by Techpoint and adopted by many manufacturers, most notably Hikvision – Dahua’s primary competitor. Hikvision is the largest manufacturer of HD-TVI in the world. LTS Security is the biggest reseller of their products. Then came AHD (Analog High Definition) developed by NextChip, a Korean manufacturer. AHD is interesting because most of its distribution has come in the form of no name brands. However, it was recently adopted by Samsung, making the technology considerably more legitimate as far as mainstream markets and long-term sustainability go. HD-AHD cameras are very cheap and are intended to occupy the low-end market. So what are the primary differences between these technologies? You may have noticed that none of the technical specs really differentiate from each other. There are minute differences in what chips or image sensors they’re using, but ultimately for the end user there’s not enough to make a point of it. Now if you were to ask the individual vendors and manufacturers they’d probably have enough to fill your ear for days (sometimes splicing in enough animosity to give the Israeli-Palestinian conflict a run for its money!). But what if you’re just an end user looking for a solution to your security camera problems? Well, by 2015 and heading into 2016, you can be reliably assured that most analog HD cameras will offer up to 1080p image quality and can transmit data over 500m+ of distance. These resolutions are only going to get better as time goes on, too! What concerns you as a customer is the split in how these technologies encode their videos or, to be more specific, in their DVRs (Digital Video Recorder). While IP cameras can encode from the camera itself, as IP cameras are essentially tiny computers, HD-CCTV’s send their data to DVRs for encoding. The problem is that each technology must use its own DVR. 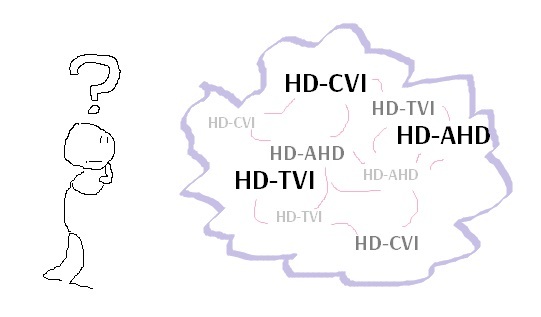 You cannot cross an HD-CVI camera with an HD-TVI DVR, for example. This is important as it means the consumer will be sticking with the technology they purchase first. Another large difference is just who, exactly, is manufacturing these technologies. HD-CVI products are both developed and manufactured by Dahua. Based out of China, Dahua surprisingly does very little marketing, although their HD-CVI technology can at times be found masked by behind other names like HD-AVS or HD-MPX. Conversely, HD-TVI was developed by Techpoint, but Techpoint is a chipset manufacturer. HD-TVI products are instead sold through other manufacturers, most notably Hikvision which, as mentioned, is the largest camera manufacturer in the world, and LTS Security, which stands as the largest reseller. HD-TVI was also made to be open source, so there are a lot of smaller manufacturers moving HD-TVI products around the market. HD-AHD is the most notorious for being distributed by no name brands, which means its price point is also considerably lower than its two competitors. However, as mentioned before, HD-AHD was also recently picked up by Samsung which makes it much more formidable on the market today and especially going forward. So what’s with the boring manufacturing talk? Generally speaking, while these cameras have little technical differences, you are likely to see quality issues depending on who you are buying them from. A no-name cheapo brand is definitely going to be more interested in cutting costs to ship out a low-cost product. You don’t just magically cut manufacturing costs, quality is going to be taking a hit somewhere. For you, the customer, you just need to keep in mind that you get what you pay for. If you’re seeing giant gaps in pricing between similar products then you also need to be looking at who is manufacturing the product. DVR’s cannot communicate across technologies. Manufacturer reputation is crucial to purchasing a reliable product. For a list of reputable sellers, please refer to our Shop By Brand section. One of the specifications camera purchasers often see are the IP and IK protection ratings….